No one likes cleaning up poop, but when it comes to your feline friends, we understand that you do what you need to do to make them happy. That is why owning the best litter box doesn’t just make your cat happy, but it also helps you with the cleaning process. Hence, to help you purchase a box that meets your feline's needs and your pet-owning life more comfortable, we’ve compiled a list of five leading litter boxes and broke down their specifications. What is a Litter Box? How Often to Clean Litter Box? How to Hide a Litter Box? How Many Litter Boxes for Two Cats? How to Keep Litter Box from Smelling? To start things off, we wanted to include the PetMate Top Entry Litter Pan because we did find out that this is an upgraded model. PetMate is well-known and has a solid reputation that was enough to get them on our best-of list, but we still wanted to see how the upgraded PetMate Top Entry Litter Pan compared when tested amongst others. When you look at the PetMate litter box, you might think that it seems like a Rubbermaid container that you can make on your own; well, think again. 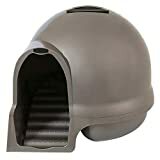 The PetMate has a dark grey base and a white, perforated lid that can either be removed entirely or merely flipped back. The perforations in the cover are there to allow the litter stuck in the cat ’s paw to fall back into the box. Concerning dimensions, the lid is nine inches across, while the litter box itself is 20’’L x 15’’W x 15’’H. Additionally, the PetMate litter box includes a built-in hook so you can store the litter scoop and you can purchase pan liners to make clean-up easier. When testing out the PetMate box with our feline friends, we found that the box did a great job of keeping the litter inside where it belonged. We also really like that it’s large enough to suit large cats, and provides ample privacy. Also, the built-in hook for the litter scoop is a great feature, and the upgraded flat base makes it extremely easy to clean and shows that PetMate is interested in listening to the feedback of their consumers. We have noticed that the lid occasionally falls off entirely when being flipped open, and the box should be placed in the corner so that your cat would use it correctly and make the most of the perforated holes. We also don’t find that the liners for the PetMate are durable since there is quite a bit of tearing, and found that clean-up became more a problem when they were used. We understand that not all pet owners can clean their cat’s litter box as often as they’d like. To even things out and make it fair, we included some disposable litter boxes to break down the specifications that busy cat owners would look for when investing in a box that can be tossed away without much worry. Let’s start off with some highlights to get things going. One of the key selling points of the Wonderbox is the versatility. 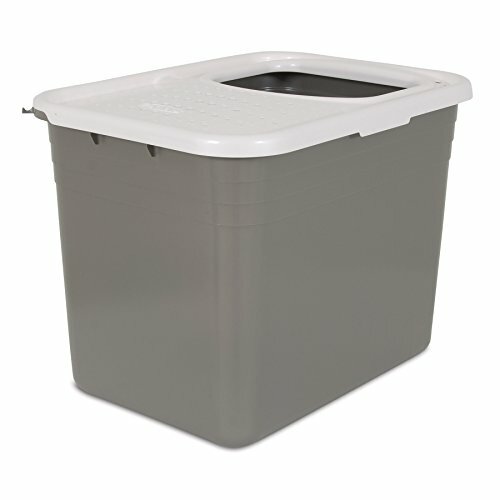 Not only is it a litter box, but it can also be used as a litter box liner. The integrated air filtration system along with the balanced pH levels of the paper assist with neutralizing ammoniacal odors, which come from urine. Additionally, it’s made from biodegradable and recycled paper and claims to last up to four weeks with proper cleaning. The Wonderbox does fit standard litter boxes when being used as a liner and is more durable than a wide range of other disposable litter boxes available on the market. As such, the Wonderbox is great for households with multiple cats. Given the state of our earth, the fact that the Wonderbox is made of 100% biodegradable and recycled material is something that can’t be overlooked. We also really like the multi-uses that come from purchasing the Wonderbox. Also, clean-up was almost effortless, especially when used as a liner. 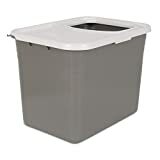 The disposable litter box is very affordable, which is also an added benefit, and we didn’t find that there was any sogginess from urine or anything else, even when using a cheaper brand of kitty litter, as long as it was cleaned daily. Surprisingly enough, we found that there were some added benefits to the Wonderbox: cats seem to like to sleep in the empty ones, and even use them as a scratching post. These litter boxes are smaller than expected, and unless purchasing a jumbo size, they wouldn’t be suitable for the majority of adult cats. Also, we didn’t notice that there was much of a difference regarding odor control. If the cat’s waste is left with an unscented litter, the recognizable kitty litter smell is still present. When you’re a cat person, that automatically means that you have to be a litter box person, too; unless you want cat mess all over your floor. Unfortunately, you can only judge the shape and size of your potential litter box when you’re in the store, so we took the PetMate Clean Step Litter Dome and gave it a run for its money to fill in the blanks. Keep reading to find out if the Litter Dome is as good as the claims say it is. Cat owners who are looking for a litter box that is both aesthetically pleasing and functional are in luck with the PetMate Litter Dome. It’s sized perfectly to fit into any house or apartment and has steps built into the entrance of the tray itself to assist with catching granules of litter from your cat’s paws. It has a hooded, and dome design that provides your cat with the privacy it needs to do its business and keeps litter from being kicked outside of the box. Also, the top and bottom separate, so cleaning is easy. Additionally, it has a pearl finish and comes in a variety of colors as well as add-ons, such as an entry ramp. As far as kitty litter boxes go, the Litter Dome is one of the nicer ones to look at. It has a very stylish and sleek design that makes you want to purchase it. The litter box also has excellent odor control and was very easy to clean. We like that it comes in multiple colors, so we were able to choose one that suited the area we were housing it in. We also love that the top and bottom separate quickly, so there wasn’t a struggle each time the litter box needed to get cleaned out. The plastic used to construct the dome itself is durable and smooth, and rinsing it out when completely replacing the litter was easier than expected. There wasn’t too much that we didn’t like about this litter box, and even found that the company listens to their consumers and have worked on upgrading their models according to customer's dislikes. That being said, the design is somewhat bulky, large, and awkward. Due to the shape, it can’t fit into a corner, so it’s not possible to hide it. Also, the bean-shaped litter area inside of the dome doesn’t seem like it would be suitable for a cat over 15lbs. The biggest downfall to owning a cat is the litter box that comes along with them. Even with cats that you let poop outside, it’s still essential that you have a litter box in your home to ensure your cat isn’t leaving any messes in hard to find places. Litter boxes aren’t usually that nice to look at, but with the ecoFlex Litter Loo now on the market, concealing your litter box is now possible. We incorporated this specially designed litter box for those of you who need to disguise the eyesore. There are two different versions available for the ecoFlex Litter Loo, and for our comparison, we looked at the standard version. There isn’t much of a difference between the two, other than the jumbo version can house larger cats, litter boxes, and the majority of self-cleaning litter boxes. The ecoFlex is made of recycled, earth-friendly material and it doesn’t require any tools to set it up. It has a table design, so the litter box is camouflaged as an end table. Also, the Litter Loo is easy to clean and has a large door that opens up, and sealed floor that prevents any leak. There is also a one-year manufacturer’s warranty to protect your purchase. The ecoFlex Litter Loo is one of the nicest litter boxes that we’ve used, and it’s very aesthetically pleasing, which makes it a high selling point. We also like that it’s made of recycled material, making it friendly to the environment. There is great odor control that takes away any worries of using it as an end table, and we found that the ecoFlex material didn’t absorb moisture. While we didn’t find it difficult to put the Litter Loo together, we did notice that there were some struggles with a few of the screws that caused it to take extra time. The standard size of the Litter Loo is a bit on the small size, and we would recommend going with the jumbo size to provide added comfort to your cat. Also, the material of the Litter Loo appeared to be a bit brittle on the side portion of the door. We’ve come down to the final litter box of our ‘best-of’ list, and to end it, we included another disposable litter box to even out the competition. How does Nature’s Miracle Disposable Litter Box compare to all the others on the list? You need to keep reading to find out and see if it wins best overall. The affordable disposable litter box is made from entirely recycled paper, making it land-fill and environmentally safe. The baking soda that’s integrated into the litter box helps protect against ammoniacal and other litter box odors, while the durable materials used to make it keep it from shredding or leaking. Also, Nature’s Miracle box can be used with a variety of litter. Outside of the affordability, the use of recycled paper and the different sizes available are some of the things that we liked. We also really liked how easy disposable litter boxes make it to clean up. It’s still important to clean out the mess daily, but when changing the litter completely, you just need to dump the litter box in the trash and start with a fresh one. They can be used as litter box liners, and the cats really seem to enjoy using them as beds and scratching posts. The standard size disposable box was quite small for an adult sized cat, and we would only recommend it for the training of a kitten. We also found that the material did absorb a bit of moisture which resulted in some odor if the mess was left unattended for an extended period. You might not realize it, but the litter box that you provide your cat can significantly impact their happiness, personality, and temperament. That is why ensuring that your pet has a suitable litter box is one of the most critical aspects of owning a feline. We’ve gathered up a few things that you should keep in mind when purchasing a kitty litter box so that you can follow along with the guide to make sure your cat is getting what it needs. 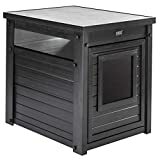 However, you should also look at your cat’s abilities, like, if your cat has issues jumping, you might want to avoid a litter box that includes a top door feature. Various types of litter boxes are available, and your situation should determine the best for you. There are standard boxes, spinning boxes, disposable and biodegradable litter boxes, self-cleaning litter boxes, and many others. If you’ve always used a specific type of litter box with your cat, it’s best to keep them on the same routine. On the contrary, if you’re a new cat owner and feel like a self-cleaning litter box or disposable box suits your situation, they are highly recommended. One of the first things that you are going to notice when looking to buy a new litter box is that they come in a wide variety of shapes. Some are designed to simply save space, while others come in a designer shape for aesthetic purposes. Research shows that the bigger the litter box, the better. With that said, the shape doesn’t seem to have much of an impact on the box itself, just as long as the box is sizable enough for your cat to use easily. Like everything else, litter boxes come constructed out of a variety of materials. The disposable and biodegradable boxes are typically made out of cardboard and are suitable for short-term use. It’s important to keep in mind though that cardboard boxes can get messy very quickly, especially if you have a cat that likes to scratch. The best material to look for when purchasing your litter box would be a durable plastic. The bottom of the box might get scratched up over time, but it should last for a minimum of one year as long as the plastic is of a decent grade. The majority of vets and experts recommend investing in a large, plastic litter box for your cat. Brands of litter boxes can be found everywhere, but the main thing that you need to look for when buying a litter box is the quality of the design. As long as you purchase something with durable plastic and a build that is suitable for your cat, you should have something that your pet is going to feel comfortable urinating in. The dimensions of a kitty litter box are going to vary greatly depending on the size and shape of the model that you look at. As a rule, it’s suggested that you have a litter box that is 1.5 times the length of your cat since they would be happier with the proper amount of space provided for their size. So, if an average cat is 18 inches in length, the litter box should be 27’’L x 18’’W. A litter box is a small tray or box, which is typically filled with litter granules or sand and is used by small animals such as cats, rabbits, small dogs, and more. The purpose of the box is to provide your pets with a place for indoor urination and defecation. Cleaning your litter box would depend greatly on your specific circumstances. It’s recommended that you clean out any clumps of urine or feces from the box daily. Of course, the number of cats that you have would determine how often you should entirely change the litter. As a rule of thumb, clumping litter can usually be changed every two weeks, while clay litter can be changed twice a week. It’s important to remember that if you notice an odor, you should replace the litter. If you aren’t looking to spend the extra money on purchasing a litter box that doubles as an end table or something else, you can still use your creativity to design a way to hide it. You can store the litter box beneath a table and then install some curtains to hide the box. Additionally, you can store it inside of lower cupboards where you store the kitty litter and keep the doors open when needed, and closed when the box needs to be hidden. There are plenty of tips available online for creative ways to conceal your kitty litter box. Vets and experts everywhere seem to all agree on one thing, and that’s the number of litter boxes that should be available for two cats. As a rule, you should have 1.5 litter boxes available for each cat, which means that if you have two felines, you should have three litter boxes. The reason for that is territorial cats can prevent a more submissive cat from using the litter box, which could result in an unhappy pet and messes left around your home. If you have three litter boxes for two cats, each pet is provided with their own box to defecate, and a third is left to ensure cleanliness and happiness with your pet friends. There are multiple ways to ensure you keep your cat’s litter box from smelling. First and foremost, removing clumps of feces and urine daily is the most effective way of eliminating any odors. The longer the waste sits in the litter box, the more it’s going to smell. It’s also recommended that you replace clay litter at least once a week and clumping litter every two weeks, depending on your situation. Additionally, you can also try litter deodorizers that include baking soda, as well as brands of litter that has a scent that isn’t bothersome to you or your cat friend. After spending the amount of time necessary to break down what we thought would make the best litter box, we were finally able to make our choice. We compared things such as odor control, durability, size, and more before we made our final decision. When we look at everything offered, we feel that the ecoFlex Litter Loo is the best option. It comes in a variety of colors, multiple sizes, and is pleasing to the eye. 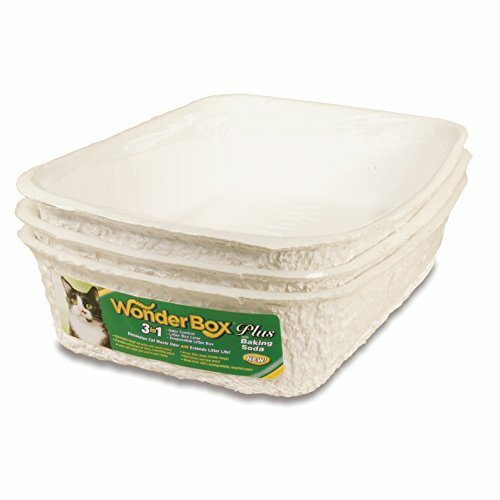 For those of you looking to spend a little bit less on a litter box, we also recommend Kitty’s Wonderbox Disposable Litter Box, especially when needed for a short time. Phew! Talk about a smelly job! Some recommended products may use affiliate links. TheJunkeeBee.com is a participant in the Amazon Services LLC Associates Program, an affiliate advertising program designed to provide a means for sites to earn advertising fees by advertising and linking to Amazon.com. Amazon and the Amazon logo are trademarks of Amazon.com, Inc or its affiliates. Copyright © 2018 The Junkee Bee | All Rights Reserved.